Koalisi Masyarakat Sipil untuk Mahkamah Pidana Internasional, yang merupakan kumpulan organisasi masyarakat sipil yang mengkampanyekan ratifikasi dan implementasi ICC (International Criminal Court) mendorong pemerintah untuk meratifikasi ICC pada tahun 2008 ini. Selain karena sudah dicanangkan dalam Rencana Aksi Nasional Hak Asasi Manusia (RANHAM) 2004-2009, ratifikasi ICC pada tahun ini akan menjadi ukuran keseriusan Indonesia dalam rejim keadilan internasional dan menghentikan impunitas. Ratifikasi ICC pada tahun ini juga sangat tepat karena bertemunya empat momentum historis, yaitu bahwa tahun 2008 adalah 6 tahun sejak berlaku secara efektif Mahkamah Pidana Internasional, satu dekade disahkannya Statuta Roma, satu dekade reformasi dan satu abad kebangkitan nasional. Ratifikasi ICC tahun ini akan menjadi awal pembangunan Indonesia baru yang lebih menjunjung keadilan dan menolak impunitas. Ratifikasi ICC yang merupakan mekanisme sistem keadilan internasional menjadi satu kebutuhan untuk menghentikan impunitas bagi berbagai kasus pelanggaran HAM yang berat yang tidak tuntas dan mencegah terjadinya kasus pelanggaran HAM yang berat di kemudian hari. Indonesia juga telah berpartisipasi secara aktif dalam proses pembentukan ICC tanggal 17 Juli 1998 pada Konferensi Diplomatik di Roma. Pada saat itu, Indonesia telah menyatakan dukungannya atas pengesahan Statuta Roma dan pembentukan ICC. Sebagaimana dinyatakan dalam RANHAM 2004 – 2009, Indonesia disebutkan akan meratifikasi Statuta Roma Tentang Mahkamah Pidana Internasional (ICC) pada tahun 2008 ini. Namun sampai pertengahan tahun ini, usaha-usaha untuk meratifikasi ICC belumlah nampak meyakinkan, sehingga ada kekhawatiran ratifikasi baru bisa dilakukan pada tahun 2009, atau bahkan bisa mundur lagi mengingat tahun 2009 akan ada agenda Pemilu. Sampai hari ini, 106 negara telah meratifikasi ICC dan hanya 7 diantaranya dari Asia yaitu Afghanistan, Tajikistan, Mongolia, Kamboja, Timor Leste, Jepang dan Korea Selatan. Ratifikasi oleh Indonesia akan memberi contoh dan dorongan bagi negara-negara lain di wilayah Asia. 1. Pemerintah Indonesia harus menjalankan komitmennya sebagaimana tertuang dalam RANHAM untuk meratifikasi ICC tahun 2008 ini karena akan sangat berpengaruh dalam proses penegakan HAM dan menghentikan praktek impunitas di dunia internasional, khususnya di Indonesia. Penundaan hanya akan menjauhkan Indonesia dari semangat mewujudkan keadilan dan melawan impunitas. 2. Koalisi Masyarakat Sipil untuk ICC bersedia dan siap untuk duduk bersama dengan pemerintah, dalam hal ini Depkumham serta Deplu sebagai focal points ratifikasi ICC untuk bersama-sama merancang draft naskah akademik dan RUU untuk ratifikasi ICC. Selain oleh Koalisi ini, dorongan agar Indonesia meratifikasi ICC juga dilakukan oleh Koalisi Internasional untuk ICC (CICC), sebuah koalisi internasional yang beranggotakan 2.500 organisasi. CICC meluncurkan program Kampanye Ratifikasi Universal bulan Juni 2008 dengan target Indonesia. Sebagai bagian dari kampanye tersebut, CICC telah mengirimkan surat ke Presiden SBY, Menkumham dan Menlu tanggal 11 Juni 2008. The Coalition for the International Criminal Court and its members are calling on Indonesia to take all necessary steps to accede to the Rome Statute of the ICC. In 2004 the Indonesian government issued a National Human Rights Action Plan which included as one of its chief objective accession to the Statute by 2008. Since then various actors have been working earnestly to ensure that this deadline is firmly met. Asia remains as an underrepresented region at the ICC, with only Afghanistan, Mongolia, Cambodia, Timor Leste, Tajikistan, Republic of Korea, and Japan as States Parties to the Treaty. Having Indonesia join this new system of international justice, will grant the region a stronger voice and a more meaningful participation in making this historic institution- the first permanent, independent court capable of investigating and bringing to justice individuals who commit war crimes, crimes against humanity, and genocide- a truly effective mechanism for the protection of human rights and the rule of law. Write a letter to the President to encourage him to stay on track and accede to the Statute by 2008!! You might like to use the following letter as a guide. Please be sure to “cc” all contacts below when sending your letters. It is my great honor to write to you and encourage you to firmly meet the commitment made by your government to accede to the Rome Statute of the ICC by 2008. Since May of 2004, when President Megawati issued a presidential decree establishing a National Human Rights Action Plan (RANHAM) for 2004 through 2008 which included as one of its chief objectives accession to the Statute by 2008, local human rights groups, international organizations and parliamentarians have been consistently conducting awareness raising campaigns and advocacy work to ensure that this looming deadline will be met. Recently, as part of a visit conducted in April by ICC prosecutor Luis Moreno Ocampo to Jakarta, the Ministry of Foreign Affairs arranged an Experts Group Meeting on the implications of ICC ratification. Although I recognize the importance of these types of activities and efforts, I also understand that there are currently critical questions that need to be addressed, including whether it will be the Parliament or one of the government ministries who will draft the ratification bill itself. In order to ensure that Indonesia stays on track for ICC accession in 2008, there is an urgent need to make a determination on this matter so that there is sufficient time to coordinate the involvement of the various actors in the process. I strongly believe that your country plays an important role in the region and share the view that this new system of international justice is a vital tool that will ensure that the most serious violations of human rights will no longer go unpunished. With Indonesia joining Afghanistan, Mongolia, Cambodia, Timor-Leste, Tajikistan, Republic of Korea and Japan as States Parties to the Court, the region will have a stronger voice and a more meaningful participation in making the International Criminal Court a truly effective international mechanism for justice and peace. New York, USA – The Coalition for the International Criminal Court (CICC)—a global network of more than 2,500 civil society organizations—this week called on the Republic of Indonesia to accede to the Rome Statute, the founding treaty of the International Criminal Court, without delay. 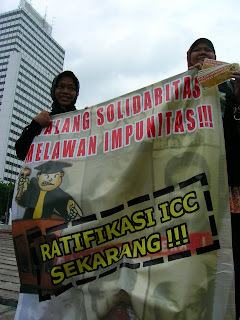 Indonesia is the June 2008 target for the Coalition’s Universal Ratification Campaign (URC), which each month calls upon a different country to join the Court. the CICC urged Indonesia to prioritize its accession to the Rome Statute. The letter noted that the National Human Rights Action Plan (RANHAM) for 2004-2008, which was issued by presidential decree under President Megawati Sukarnoputri, established ICC accession by 2008 as a chief objective. Since then, local and international human rights groups as well as Indonesian parliamentarians have conducted a number of awareness raising and advocacy events to ensure that Indonesian accession to the Rome Statute stays on track for this year, which marks the tenth anniversary of the adoption of the Statute. One of the most critical remaining questions is whether the Parliament or one of the government ministries will draft the ratification bill. Once this has been determined, the coordination of all necessary actors in the process can get underway. The Coalition firmly urged Indonesia to follow through on its commitment to join the Court this year. Once Indonesia joins the Court, the under-represented Asia/Pacific region will have a much stronger voice at the ICC and can participate in a more meaningful manner. Currently, only seven Asian states—Afghanistan, Cambodia, Japan, Republic of Korea, Mongolia, Tajikistan and Timor-Leste—are member states of the Court. Indonesia’s accession is sure to spur other states in the region to join the growing global movement for accountability for the most serious crimes. There are currently four active investigations before the Court: Uganda; the Democratic Republic of Congo; Darfur, Sudan; and the Central African Republic. The Court also has several situations under analysis, including in Colombia and Cote d’Ivoire. It has issued arrest warrants in each of the four situations under investigation. The May 2008 target for the Coalition’s Universal Ratification Campaign was Swaziland.